Lasky, Kathryn. 2004. BLOOD SECRET. New York: Harper Collins. ISBN: 006000066X. 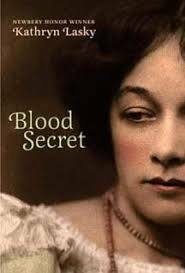 Blood Secret is a fascinating story in which a young girl discovers the truth about her heritage through objects discovered in her great, great aunt's basement. Kathryn Lasky has written a very gripping story that stretches across centuries. In this historical novel, Lasky has successfully included fantasy elements that involve time travel, creating two convincing, reminiscent settings: the present-day Southwest and Inquisition-era Spain. Jerry Luna is an elective mute. She has been that way since her mother disappeared from a campground when she was eight years old and has lived in various Catholic Charity homes ever since. Now she lives in New Mexico with her elderly Aunt Constanza. As Jerry begins to settle in, she discovers an old trunk in the basement of her aunt’s house. The objects in this trunk seem to speak to her and transport her back into the past. During these historical time travels, Jerry learns about her family’s past as the reader learns of the persecution of Jews during the time of the Spanish Inquisition. As Jerry learns about her family’s history, she also makes connections with some of her aunt’s unusual traditions, including the lighting of candles each Friday evening. When Jerry asked her Aunt Constanza about this tradition, she didn’t know why she did it, only that her mother taught her to do it. As Jerry continues to explore the items in the trunk, she begins to find historical answers for almost all of her questions, and discovers that she is not the first person in her family to bury her sorrows in silence. As she learns more about her family's rich and troubled heritage, she finds herself questioning everything: her traditions, her name, and even her Catholic faith. She also begins to discover the voice she buried so long ago. Kathryn Lasky has done a wonderful job of presenting historical facts in a modern day setting. School Library Journal states, “The story of Jerry's ancestors is skillfully interwoven with that of her present life. With each glimpse into her past, she is drawn more into her own family circle with her aunt.” Lasky tells the story through third person narration, however, the historical narrative of Jerry’s ancestors is told in first person. Blood Secret weaves history, heredity, and faith into the storyline creating a very powerful novel that will intrigue readers.